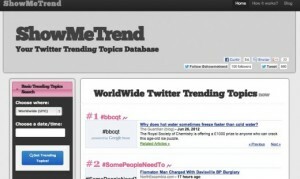 Show Me Trend is a database that shows the current issues (Trending Topics) on Twitter in real time and also the past though limitedly. Undoubtedly, the current issues of Twitter have become very important and not only for the common user, are also viewed by many media to know what is happening around the world, it is the most “fresh”, the most updated, we can find on the net. 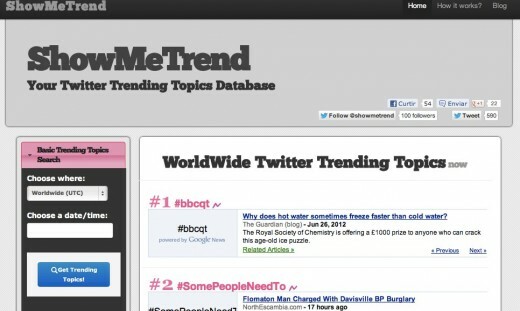 Show Me Trend is running since September 2011, but at the beginning, the consultation of the trending topics in the past is limited and we can only refer to those produced from October 25, 2011. Another interesting feature is that in addition to the day, we can see the issues of the day at a certain time of day. For now the service offers current issues of USA, UK, Canada, Spain, Brazil, Italy, Japan, Netherlands, France and a global list, with the trendings topics taking the whole world as a single unit.